Location: Loubeyrat, in the Puy-de-Dôme departement of France (Auvergne Region). Ownership / Access: Current owner is Raphael Bruny. Open for tour charge, tourist activities, facility rentals. 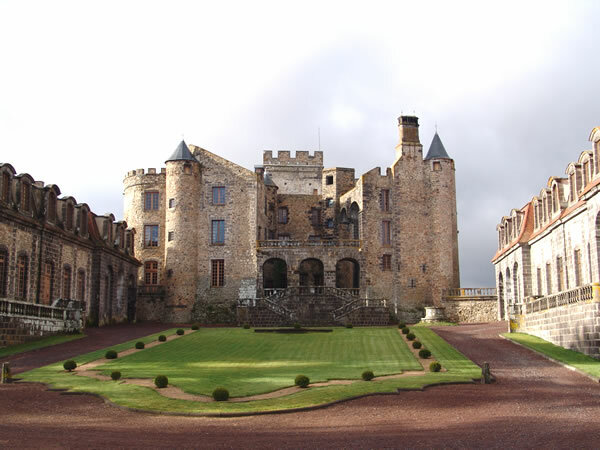 Notes: Château de Chazeron is located in the French department of Puy-de-Dôme in the town of Loubeyrat, Canton Manzat. The keep dates from the nineteenth century and the stately home with the fifteenth century, it forms a set of towers flanked buildings surrounding a courtyard. In the seventeenth century a wing was destroyed to open this court on the esplanade and turn it into courtyard. Access is by a day portico preceded by a double porch railing. Common to an attic floor are located on a closed esplanade. In the gardens and outside the castle are of the eighteenth century remains of buildings are spread in the gardens The castle, the large courtyard and common were classified historic monument 2 June 1944. The castle park Chazeron was designed in the seventeenth century during the opening of the court and work resumed in the eighteenth century. He is admitted to pre-inventory of remarkable gardens.